Learning disabilities aren't the same as learning challenges that are caused by problems with seeing, hearing, or moving. They aren't linked to emotional problems or to your culture, environment, or income. 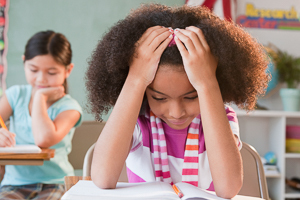 But many children with learning disabilities have other problems that make school hard. These include ADHD and problems with behaviour or memory. Find it hard to learn the alphabet, numbers, days of the week, colours, shapes, and how to spell and write his or her name. If you think your child has a learning disability, speak with your child's doctor, teacher, or school counsellor. You can also ask your child about any problems that he or she may be having in school. A learning disability is treated by using educational tools to help overcome it. Medicines and counselling usually aren't used. For most children, an Individual Education Plan (IEP) will be created. An IEP may also be called an Individualized Program Plan (IPP). An IEP details your child's disability, appropriate teaching methods, and goals for the school year. The IEP changes based on how well your child is doing. You have the right to ask for a change in the IEP if you don't agree with it. If you have concerns about your or your child's mental health, look into counselling. Counselling may be able to help you and your child deal with frustrations you may feel.